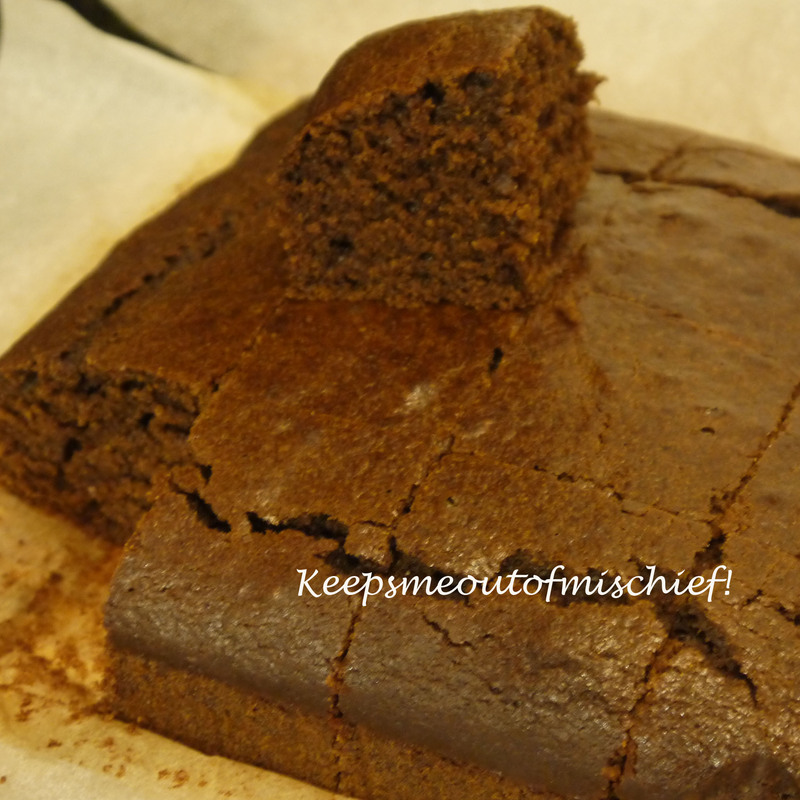 Gingerbread | Keeps Me Out Of Mischief! As a child I used to love gingerbread; whether it was the biscuit or cake kind I didn’t really care! I haven’t made the cake kind for years though as I’ve never got any black treacle in the house (the biscuit kind is here). I never think to buy it but, when I was doing my online shopping (a saviour when you’ve got a small child who seems to hate the supermarket already! ), I was going to put golden treacle in as usual but noticed they had black treacle and found thoughts of gingerbread popping into my head. Due to the fact that I’ve got a terrible case of baby brain at the moment these thoughts crowded out all sensible thoughts of what we actually needed from the online shop so we’re going to eat some very strange main meals this week – no matter, there’s gingerbread for dessert, lovely with a bit of custard! 175g margarine, 225g black treacle, 50g demerara sugar, 350g plain flour, 2tsp ground ginger, 150ml milk, 2 medium eggs and 1tsp bicarbonate of soda. Preheat the oven to 150°C/ 300°F and lightly grease and line a 20cm deep square cake tin. Place the margarine, black treacle and sugar into a saucepan over a gentle heat. Stir occasionally until the butter melts. Take it off the heat and add the milk. This has the effect of warming the milk and cooling the mixture slightly. In a large bowl sift the flour and bicarbonate of soda, make a well in the centre and add the treacle mixture. Mix until well combined. Beat the eggs and add to the mixture, mix until there are no lumps. Pour into the cake tin and bake for 60 minutes or until a skewer inserted into the middle of the cake comes out clean. Cool in the tin, then remove. Cut into squares.